Pig Passage Indicators or Pig Sig’s are devices used to indicate when a pig has passed a certain point. They are typically used at launchers and receivers to inform the user that their pig has left the trap or arrived in the trap. There are intrusive and non-intrusive pig detectors. Intrusive pig detectors operate when a pig passes and mechanically makes contact with a lever or piston hanging down in the pipe. This triggers either a visual or electrical indicator to the user. Non-intrusive pig detectors require that a pig be outfitted with a magnet. The magnetic field in the pig will activate the receiver unit, which will then trigger a visual or electrical indicator. 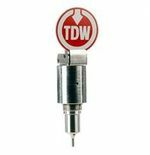 Let Drinkwater Products help you find the right Pig Detector today. 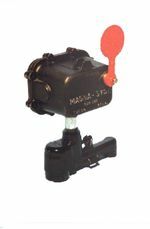 The Enduro Pig Popper is an intrusive pig signal that is manually reset once it has been tripped by a pig. The Enduro Pig Popper is available in several different options. Manual Visual alert, Electrical alert and Electrical/Manual Visual alert. Extensions are available in one foot increments for buried pipe locations. 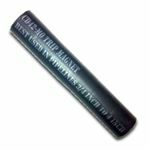 All units are also available in a lighted version. 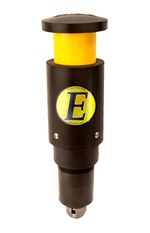 The Enduro Pig Popper is designed to be fitted on most existing 2" fittings. The MAGNA-SYGG from S.U.N. Engineering, Inc. is truly a non-intrusive pipeline pig detector. Simple and rugged, it can be strapped to the surface of a pipe or it can be used as a portable pig passage indicator. You do not have to shut down the pipeline and wait for an expensive crew to install special fittings - the MAGNA-SYGG pig detector is ready to go to work. The CD52-M0 Trip Magnet is a very small and very powerful trip magnet designed to be used with the CD52 Banit Non-Intrusive Pig Passage Signaler in very small pipelines ranging from 3/4" to 4" to indicate passages to the CD52 Bandit system. 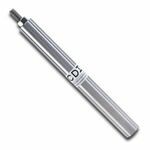 The CD52-M0 is an magnet assembly with a jacket and without a mounting stud. 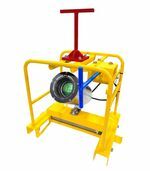 The CD52-M3 Trip Magnet is a large and very powerful trip magnet designed to be used with the CD52 Banit Non-Intrusive Pig Passage Signaler in pipelines 32" to 48" to indicate passages to the CD52 Bandit system. 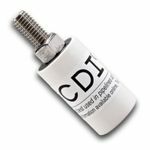 The CD52-M3 is an epoxy-encased magnet with a aluminum jacket and a mounting stud with American threads of 1/2-13. 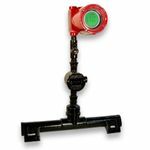 The CD52-M1 Trip Magnet is a very small and very powerful trip magnet designed to be used with the CD52 Banit Non-Intrusive Pig Passage Signaler in pipelines 4" to 12" to indicate passages to the CD52 Bandit system. 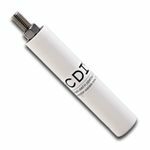 The CD52-M1 is an epoxy-encased magnet with a PVC jacket and a mounting stud with American threads of 1/2-13.